Here is an excellent post written by a man named Dominic Tennant. His blog is called “In the Habit of Goring: Where a Recovering Ex-Atheist Skewers Things With A Sharp Two-Edged Sword.” He has a VERY interesting take on women as buisnesswomen or women rulers. Aside from Deborah, this is the recurring response to the argument against female rulers. To know what is appropriate for women in business, we need to first go back to what is appropriate for women in the household, and then figure out how business relates to that. This is because the household is the primitive unit of society. It is the originator of order in the world. Adam’s household was also the original kingdom. As God’s son, Adam was a vassal king, representing God’s rule in creation. His house’s mission was to expand and carry on God’s work of establishing right order in the world (compare how Jesus, in the gospel which especially emphasizes his sonship, repeatedly speaks of doing only what the Father has given him to do). So a household is a kingdom in microcosm. As it expands and becomes many households, the kingdom in turn expands into its fullness. But it does not fundamentally change form; it only grows into maturity. This is why Israel as a national kingdom is still called the “house of Israel” (e.g. Exodus 40:38). In Hebrew, house and household are the same word: בַּ֫יִת, beyt. I use the English words interchangeably to emphasize the broader conceptual nexus that follows from the language of Scripture. God carries his rule into the world through the fathers of households. Every father rules his own house, and as these houses multiply, the wiser fathers work together to rule their clans and tribes, all the way up to the national level. The purpose of this is always right order: establishing and maintaining the relationships between people and God, and between people and people. A father is a priest and a king. This is the system we see Moses establish in Exodus 18; indeed, the virtuous woman of Proverbs 31 is married to a town patriarch who sits in the gate to judge disputes among the people, and to ensure the right order, the shalom of the houses under his care. A wife would have charge of servants and unmarried sons, with varying degrees of authority over them. But her authority was not one of judgment over moral matters; not one of ruling over these vertical and horizontal relationships; but rather over affairs of utility. Production is a separate issue to justice. Both are about ordering the world, but they are separate categories. When the Bible speaks against women ruling, it is speaking against them representing God as father and king. It is speaking against them having priestly jurisdiction over how we must relate to God or others. But it is not speaking against them representing God at all, since otherwise they would not be the image of God! Women are made expressly to complete man’s representation of God, by filling and refining the world. But here’s a wrinkle: the way God set up the world, women could have authority over men in matters of production, but that authority was still set in the context of the household. 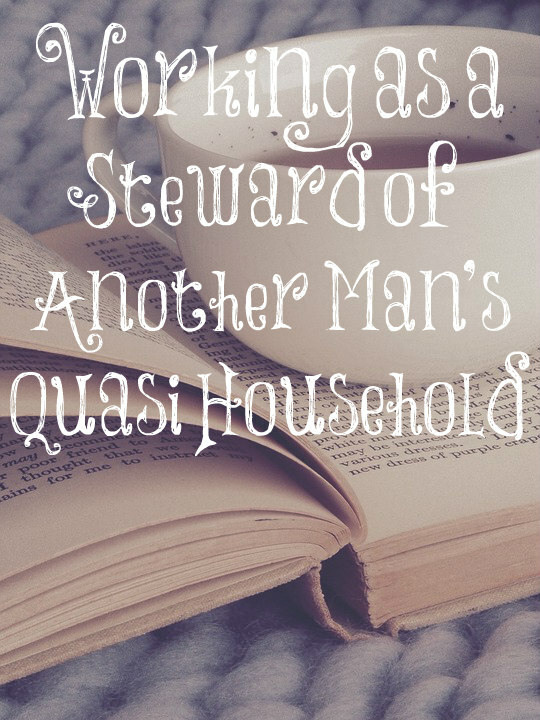 A woman was a steward of her husband, helping him to establish order in whatever way he needed. If he died, she could continue to do much of that work alone if she did not require the security of a new husband—that would be rare in the ancient world, but certainly the woman of Proverbs 31 seems capable of self-sufficiency. This is a wrinkle, because a woman working in some other unit of production than her own household is an extraordinary and novel idea. The household is where production primarily happened, and also not-so-coincidentally where a woman’s responsibility first lies. So the situation we find ourselves in today is bizarre, even pathological, compared to God’s design. A woman who works in a business that is not an extension of her household is in a weird situation. She might not have a choice, but she is effectively working either as the head of a quasi-household, if she is the business owner; or—vastly more commonly—as the steward of another man’s quasi-household, since nearly all significant businesses have men at the very top. Neither of these is necessarily wrong, but they are a far cry from the original design. It’s no surprise that women have been getting progressively unhappier as they have been progressively “empowered” in the workplace; focusing on competition and advancement rather than nurture and flourishing forces them to treat their feminine strengths and virtues as weaknesses and liabilities. For a woman to have authority in business is fine, because production is both a masculine and feminine mandate. A female executive is not representing God’s father-rule. But the business world itself is demented in that it has torn a rift between households and production, and this creates some very thorny difficulties for women to negotiate—difficulties they often negotiate poorly, and end up regretting when they are older. It masculinizes many women—short hair, power suits, bossy attitudes—and makes them both unattractive and miserable. If it is at all possible, it is far better for a woman to focus on stewarding the production of her own household than of an emaciated household-knockoff. Wow, this is really an interesting post. Bravo Lori. I’ve run several small businesses over the years, and have always been thinking about male employees vs. female. Your thoughts on “productive” and “household” are very original. If we look at the female CEOs that the press keeps trumpeting about, almost every single one of them fails. That’s because women simply aren’t very good at leading a large group of people. Sure they put up a good imitation of leaders, but it’s so obvious that they are vastly more comfortable in “wifely” support roles, in accounting, HR, or office management. Entrepreneurs who hire women in leadership roles like sales or engineering inevitably regret it, often destroying their companies. In any case, this is all crashing to the ground. Male CEOs like me have effectively STOPPED hiring women wherever we can possibly do so. This is because of the horrific abuses of #MeToo. What is the biblical viewpoint on female heads of state, eg Prime Minister, and the Queen? God choose men to be kings as rulers over nations so I am thinking that this is what is best. But hang on… doesn’t the Bible specifically speak about the rulers being chosen by God? Or allowed by God? Something along those lines? And that we are to obey the laws of the land (that these rulers may make)? So surely, if God didn’t want a woman to be the leader of the country, he wouldn’t have allowed it? I was actually thinking of Romans 13:1-7 especially where it says the authority that exists is established by God. So does this apply to women preachers, too? They are in authority in the churches even though God has forbidden it. No, God won’t contradict His Word. It is considered a curse to be led by women. thank you so much for this post! I was so afraid I was outside of the Lord’s design! I have been working from home and living with my parents and started my own religious art: prints and cards business. The cards have bible verses in them to share Christ in addition to sharing bible stories. I have been preparing how to raise children, cook, and clean in addition…and most of all study God’s word to teach it to my children. I am still dating and getting to know young men in hopes of finding someone to marry. Isn’t it very simple ? Whilst unmarried women can work to help support their family and married women do sometimes have to work, all of this is, or should be within the context and under the authority of their family and for that purpose. Oh, my goodness. That article was amazing. Is it wrong that countries have female Prime Ministers? Female Principals of schools? Is it wrong in God’s view to have a Queen? “As for my people, children are their oppressors, and women rule over them. O my people, they which lead thee cause thee to err, and destroy the way of thy paths.” (Is. 3:12) According to God, it is. Wow! A great post. Though what do you say to royalists, and those who think female politicians are God’s will? What do you say about Queen Esther? Evidently, she was appointed by God. She was never a ruler over any people. The king was. Merry Christmas to you and your family, Lori. I am very much enjoying your videos. You are a blessing to me. Thank you! Bravo, Lori. Though in our country have a Royal Family with a Queen. Not sure if God agrees with this.